1. A velvet futon so impressive that no one will believe it's a futon because we're all so used to those unsightly metal behemoths. I can say that because I owned a metal behemoth for, like, six years. Major FYI: You can shop tons of The Novogratz home decor on Amazon. Get it from Amazon for $390.93+ (available in three colors). 2. 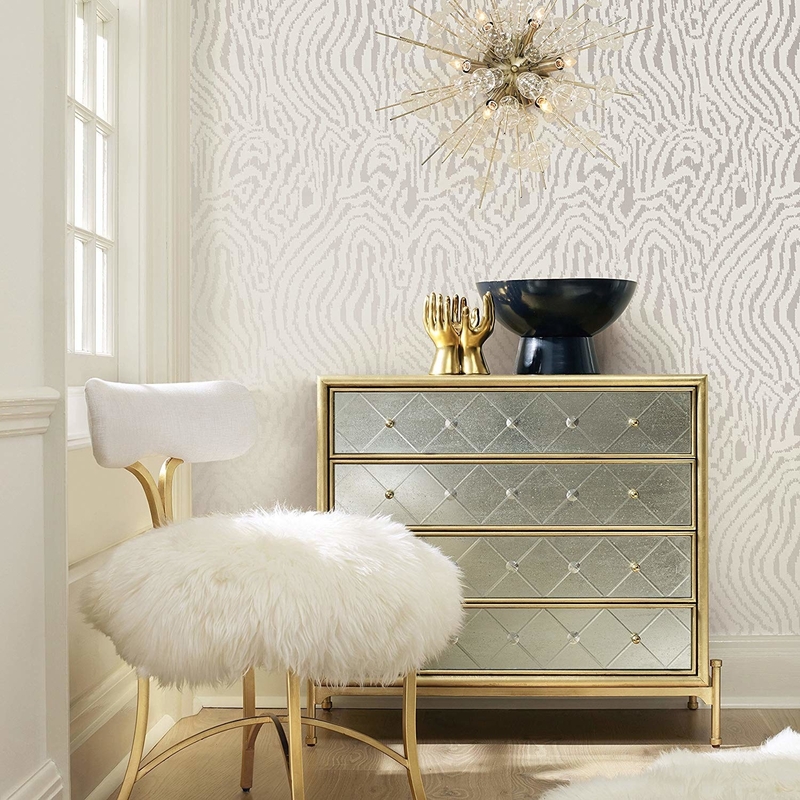 Peel-and-stick wallpaper to help you get a snazzy look 'til you're on an interior designer budget. My dream look, tbh. This removable wallpaper is self-adhesive so you don't have to worry about using pastes or glues, and is repositionable for easy installation. BTW, it was designed by Cynthia Rowley! And check out more removable wallpaper from Tempaper. Get a 20.5"x33' (covering 56 sq. ft.) from Amazon for $116.40. 3. A faux-sheepskin rug you can throw on your ugliest arm chair and turn into your damn throne where you'll wield the most important of decisions, like which series to binge-watch this weekend. Get it from Amazon for $19.98 (available in a variety of colors and sizes). 4. An enviable Dutch oven to match your kitchen, but won't break the bank like the holy grail Le Creuset. Some day. Some. Day. This enameled cast-iron beaut will be worth its weight in use over and over again. Get it from Amazon for $59.90 (available in several colors and sizes). 5. A stunning tea kettle with a cool-touch handle that'll look so glam on your stovetop like it does on mine! ICYMI, this tea kettle and I are engaged. Get it from BuzzFeed's Goodful line, exclusively at Macy's for $31.99. 6. Monstera leaf placemats to help you set your table — even if it's a tiny table squeezed into a corner! — and make every meal feel like a big deal. There's a lot to say about taking the time to sit at your table and eat dinner, even if it's some takeout you picked up on the way home from work! Get 12 from Food52 for $29. 7. A scratch-off state map as a beautiful reminder to finally take that road trip out west on the rare occasion you'll actually want to leave your palace. I own another version of this map and posted it on my Instagram and everyone asked me about it! It's gorgeous, oh-so satisfying to scratch off once I've visited another state, and has started so many convos with friends who want to take trips to the same places I want to go. Get it from Kristin Douglas Art on Etsy for $29.65 (also available without a title). 8. A gorgeous cat cave — it'll be a serious step up from that old cat bed *and* give your cat a lil' bit of privacy. Get it from Wooly Cat Caves on Etsy for $163.93+ (available in four colors and two sizes). 9. 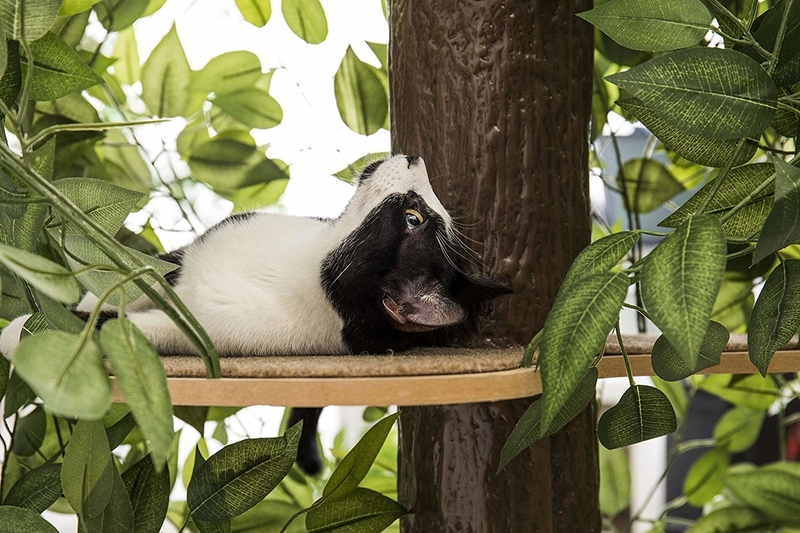 Or a cat tree, an actual (faux) tree, so your fave felines can frolick in a fixture that fits in with your house plant collection. Get it from Amazon for $135.99+ (available with a round or square base and in three sizes). BTW, the largest size is shown. 10. An indoor-friendly hammock chair that'll give hanging out a new meaning. 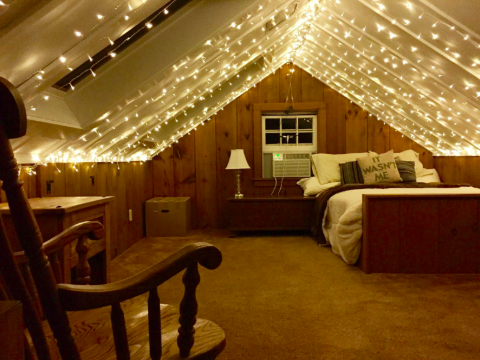 Add a throw pillow and you'll never want to leave. "Roger, plz forward all my calls to the hammock." Get it from Amazon for $71.99+ (also available with LED lights). 11. 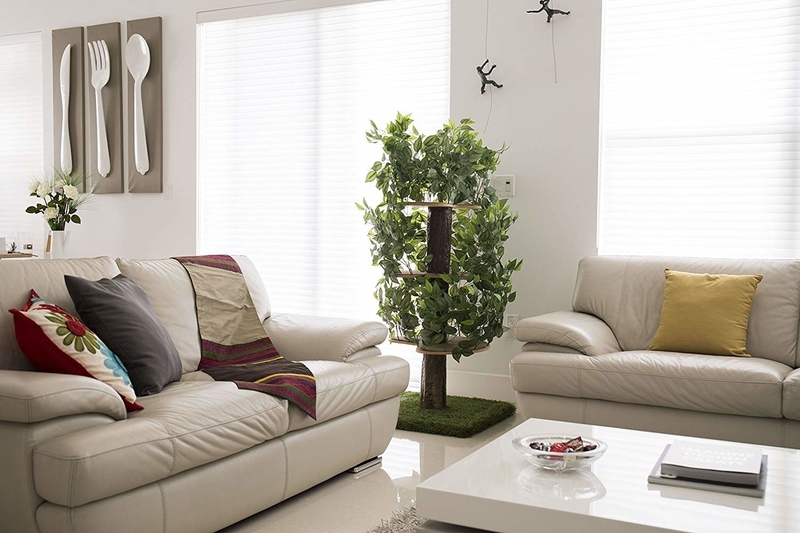 A super adaptable sofa you can take apart piece by piece and then swap out covers for over the years. Aka, you can buy one couch and build onto it as you build your life! Awwwwww. 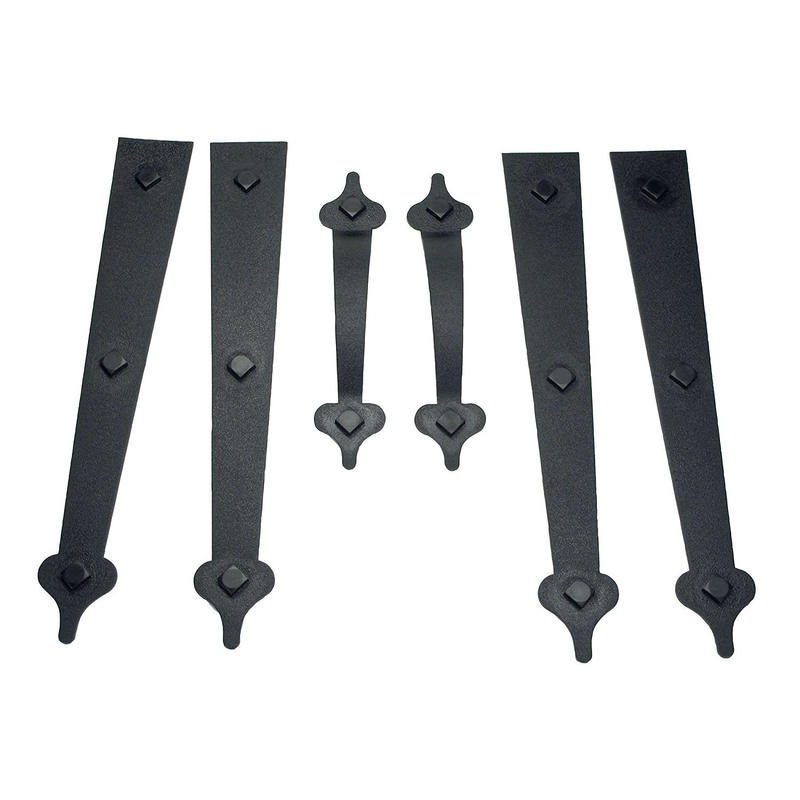 The pieces are relatively light for furniture, easily come part for moving, and can be added to onto over time with new sections. Also, there are tons of WASHABLE cover options and accessories to make it all yours. 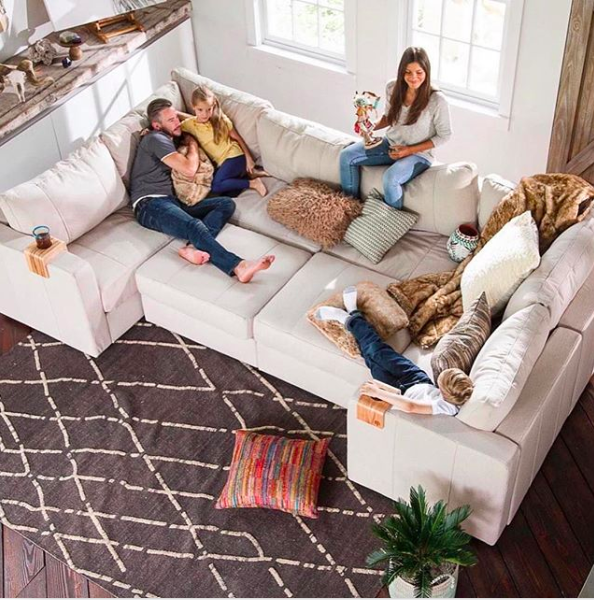 Get a couch with two seats and four sides from Lovesac for $1,600. 12. A colorful shag area rug in case you want to live in a cozy cotton candy dreamscape. Sooooo everyone?! Get a 4'x5' rug from Amazon for $31.99 (available in several other styles and colors). 13. 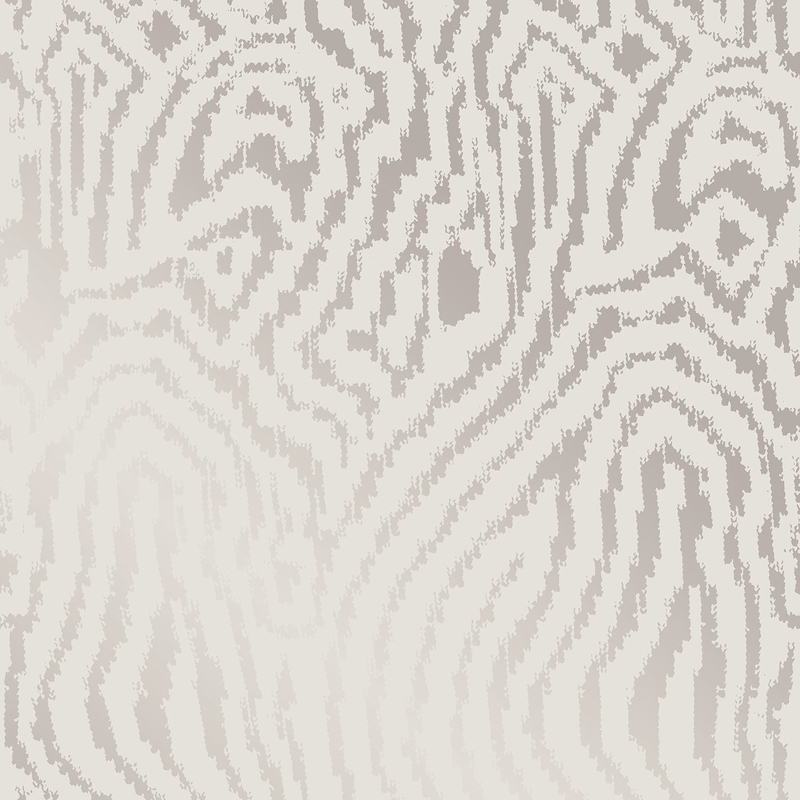 Or a boho area rug that, tbh, would be easier to vacuum in high-traffic areas but still be SO stunning. Can you believe?! Get it from Amazon for $75.81 (available in four colors and a variety of sizes). 14. 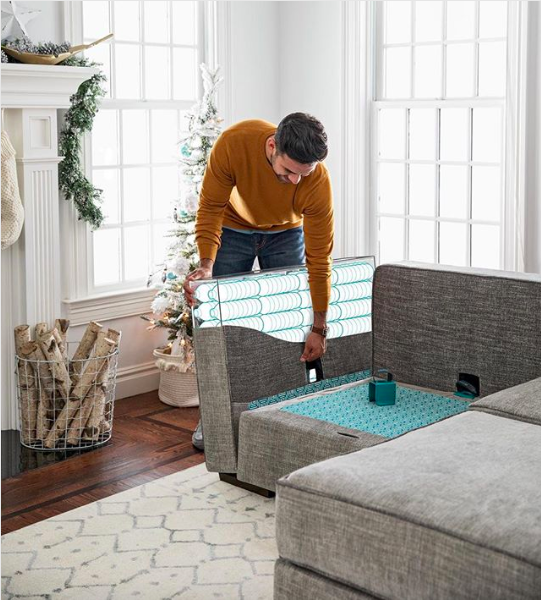 A graciously sized storage ottoman for storing your "nice" blankets 'til guests come over and then the guests can sit on this as some extra seating! Get it from Amazon for $262.80 (available in several colors). 15. Stackable ceramic plates as a fancy kitchen upgrade you can still use to heat up leftovers in the microwave and then throw in the dishwasher afterward. Includes four dinner plates, four appetizer plates, four salad plates four appetizer bowls, and four salad bowls. Get a 20-piece service for four from BuzzFeed's Goodful line, exclusively at Macy's for $89.99 (available in black or white). 16. A plant-watering bird that'll keep your plant babes hydrated and looking like their best selves, even if you currently can't be described in that way. It holds enough water for 1–2 weeks depending on soil and plant type so you should be set for your long weekend getaway. 17. And a plant BFF to hang tight and fill out your current plant collection. Get it from Popup Florist for $18. 18. A luxe-looking mousepad with a metal finish for smooth movement that'll perk up a lackluster home office — even if that home office is the couch or your bed. Get it from Amazon for $10.99+ (available in two sizes and four finishes). 19. A compact desk large enough for your laptop and some accoutrements but small enough to avoid it becoming a dumping ground. Get it from Amazon for $99.62. 20. A gorgeous office desk chair so you can sit pretty while banging out a report or two before logging offline for a long weekend. Byeeee. Get it from Wayfair for $133.99. 21. A ginormous beanbag-like chair as a spot where you'll never want to leave once you sink into its warm embrace. FYI, this giant beaut has an insert and covers you can change as your style evolves! Now you just have to build a pile of books high enough that you can reach out and grab the top one from your position. But if you'd like to share, it fits 3+ adults. Get it from Lovesac for $900 (also available in smaller sizes for $200+ and 12 cover options). We all have that stack of leaning framed art we just haven't gotten around to hanging just yet. This tools helps you measure your wall art that needs hanging and then measure out the perfect place to install hardware. 23. And if you've been putting off framing some photos, you can score a professionally framed photo for a budget-friendly price. You can download the app, upload a pic, choose a frame, and have it shipped directly to your loved one. I've ordered one from the app and the frame, matting, and photo quality all turned out beautifully! Get one from Keepsake for $25+ (available in a variety of sizes, styles, and frames). 24. Or perhaps a complete gallery wall kit (that comes with hanging hardware and paper guides!) to deck out a naked wall that's been begging for something special. I've used this kit before and it's extremely easy to use! Photos you upload to the website come matted and framed. You'll also receive all the hanging hardware and a paper template that you can use to mock up the wall where you want it and nail the hanging hardware directly into the wall. So really, all you need is photos worthy of frames, a blank wall, hammer, and about 20 minutes. Get this gallery wall from Framebridge for $350 (available in three frame styles). Check out more gallery wall kits. 25. Or a glass print if frames aren't your thing and you're looking to capture a vivid moment to make it feel like you're back there at Machu Picchu. Get it from Fracture for $17+ (available in eight sizes). 26. 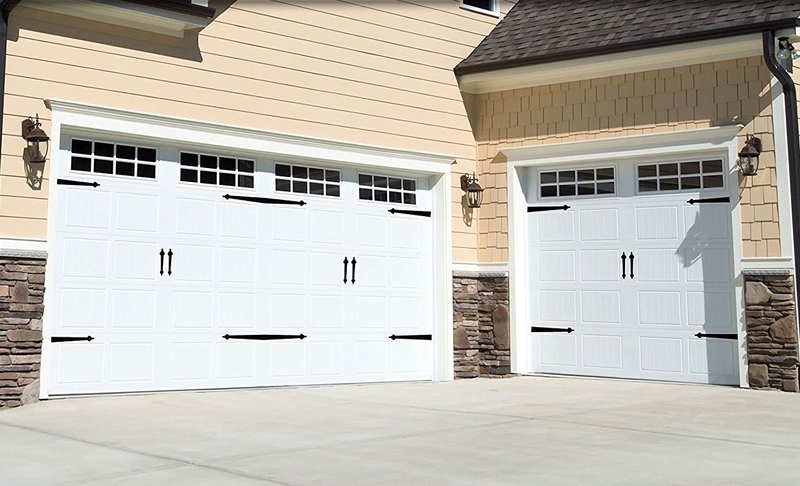 Garage magnets for achieving a desirable carriage-door style with your existing doors. And you can take them off the door easy-peasy when you move! Get a set of six magnets from Amazon for $11.75 (available in several styles and packs). 27. An over-the-door hook ready to deliver some lip service because chances are you need the storage so you might as well choose a glam option! 28. A divine candle set so you can finally set up your Golden Girls shrine. Get them from The Eternal Flame on Etsy for $44. 29. A countertop garden in case you'd like to become one of those people who cooks with fresh, homegrown herbs. WHO are you?! Has energy-efficient LED grow lights that automatically turn on and off, and the system reminds you when to water and add plant food. Includes Genovese basil, curly parsley, dill, mint, thyme, Thai basil, and Miracle-Gro plant food. Get it from BuzzFeed's Goodful line, exclusively at Macy's for $129.99 (also available in black). 30. A canopy bed befitting your royal lifestyle (with plenty of space underneath for storing all your civilian things). Get it from Amazon for $162+ (available in gold or black and sizes twin, full, queen, and king). 31. A wordy pillow any bibliophile will adore. Nancy Drew solved the mystery of who lives in the gorgeous home. It's you! This pillow features words taken from Nancy Drew: The Secret of The Old Clock in a clever design. But Nancy Drew isn't the only literary hero featured. You can also find home goods and accessories featuring works by Edgar Allan Poe, Jane Austen, Shakespeare, Ernest Hemingway, Maya Angelou, and more! Get it from Litographs for $39 (available in six colors, includes pillow and pillow cover). 32. A pretty yoga mat (that's legit v good) so you can finally make a lil' exercise nook to help find your center and then 'gram it. Get it from Amazon for $31.49+ (available in four sizes and 14 colors). The bedding set all comes in one bag and zips together. But if you move around a lot, there are comfort panels on the side to give you some more room and make it feel as if you're using a regular comforter. Plus, it can all go in the wash! Each twin comes with one pillow case and other sizes come with two. There are sets for toddlers, kids, adults, college, RVs, and more. So really a little something for everyone. Get this set from Beddy's for $249+ (available in twin, full, queen, and king sizes). 34. Or a coloring bedding set you can scribble on and then wash for a clean palette. If you use to draw on your Chucks, you NEED these. Or if you have a kid who likes to scribble everywhere but their stack of coloring books. Get it from Amazon for $54.95+ (available in twin or queen, and also in a map twin). 35. An amethyst picture holder to highlight a special moment in time amongst the OG frames on your mantel. Get it from Rock N Air on Etsy for $27. 36. A countertop painting kit that'll transform outdated surfaces into a granite look for considerably less dough than actual granite. The kit uses low-VOC, low-odor, water-based acrylic paint with a durable topcoat. You can use it on Formica, laminate, Corian, ceramic tile, butcher block, cultured marble, and traditional granite. Expect for the project to take a weekend. Get it from Amazon for $79.64. And check out more painting kits from Giani on Amazon. 37. And if you want a total kitchen transformation, a kitchen cabinet painting kit that requires ZERO stripping or priming *might* make you wonder if you're in someone else's house before you've had your coffee. Kit includes low-VOC, low-odor, water-based acrylic paint and primer in one. Requires a one-day application process that dries in a soft, satin finish. Covers 100 square feet of cabinet surface (40 linear feet), which is typical of most kitchen cabinets. Ideal for use on wood, laminate and primed, or painted metal cabinets. Formulated to cover most existing wood finishes and paint in a single coat. Get it from Amazon for $69.95. 38. And some under-cabinet lights can make your kitchen look so much more expensive and help set a mood that'll actually make you wanna cook. Get a 10' strand with 60 lights from Amazon for $17.99. 39. A bidet toilet attachment for a spa-like experience to get you squeaky clean. We reviewed the best toilet paper on BuzzFeed Reviews and recommend this for our highest price point for efficiency's sake. And it's an easy install on your toilet. Even for renters! Get it from Amazon for $34.50+ (available in two colors). 40. A retro-leaning turntable stand with plenty of space to contain your flourishing vinyl collection. It's time to break up with that plastic crate. Get it from Amazon for $149.14 (available in several styles). BTW, here's that temporary wallpaper. 41. A ~reversible~ indoor/outdoor rug you can hold onto as your design tastes change. Get it from Grandin Road for $99+ (available in three sizes). 42. Oversized Turkish cotton towels that are super absorbent, quick-drying, and large enough to qualify as a bath sheet. Time to toss out all those makeup-stained bath towels you've been using since college. (Guilty as charged!) Seriously, if you haven't gotten on the bath sheet bandwagon, you're cheating yourself. And these would ALSO work out great as gym or beach towels. If you're into the super plush variety, check out our top picks for the best bath towels on BuzzFeed Reviews. Get a set of four from Amazon for $46.90 (available in eight color combos). 43. An industrial-style table lamp in case you're after that Edison bulb style but don't want your kids bumping up against a bare bulb. Get it from Amazon for $36.98. 44. 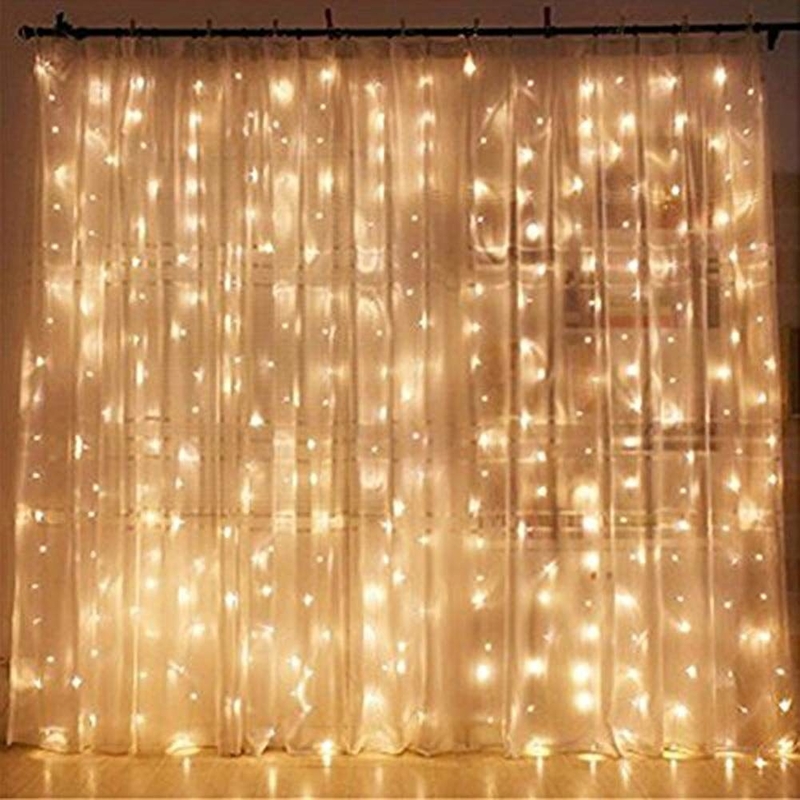 Lighted curtains you can layer with some sheer curtains for an ethereal look indoors or outdoors on the reg. 45. A macrame wall hanging that'll add some texture in a sea of framed art. Get it from Amazon for $29.99 (available in three colors). Or grab a DIY kit from Home Vibes Macrame on Etsy for $47.90+ (available in natural or colored cord). 46. An incredibly glam bar cart people won't believe you got on Amazon. It can be your new party trick! Get it from Amazon for $93.91+ (available in three finishes). And check out more of the best bar carts on Amazon. 47. Or a crystal decanter set you can empty your mid-shelf liquor into and park on a shelf in case you can't afford the floor space of a bar cart. Get the decanter and six glasses from Amazon for $34.99.